Why are gold rates different in different cities in India? Gold prices are different in every city. Well, there are few reasons as to why there is a price change. Ideally, the rate of gold is determined by the international gold rates on that day. Then logically, the gold rates should be the same everywhere but that doesn't exactly happen as there are certain variables added to that equation. 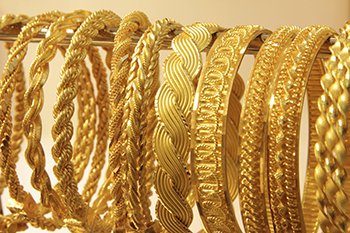 Gold is an important part of the Indian culture. It is almost used in every facet of one’s life. But, there is a small problem or it can be referred to as the big picture and exactly what is that? Gold prices are different in every city. Well, there are few reasons as to why there is a price change. Ideally, the rate of gold is determined by the international gold rates on that day. Then logically, the gold rates should be the same everywhere but that doesn't exactly happen as there are certain variables added to that equation. 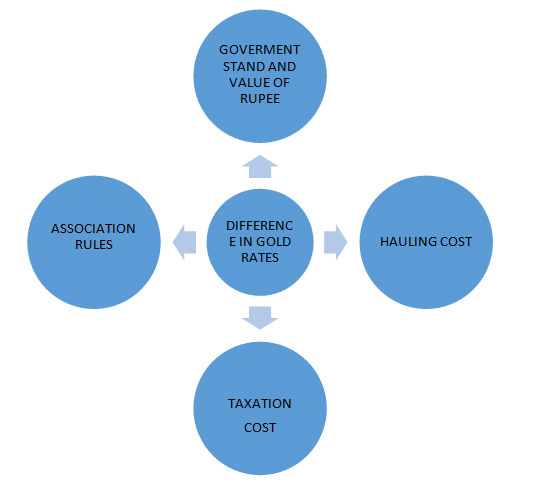 Hauling costs: Like every product available in the market, may it be consumer durables, essential items or expensive metals like gold, silver etc the transportation cost is added to the sale price and as gold is a very expensive item the cost of safeguarding it also is added to the cost and is ultimately charged at the hands of the customer. Higher the quantity, the lesser the price of gold: Technically it has been a practice of vendors to offer certain discounts in the case of bulk purchases done. Same is the case of gold too if a particular vendor is purchasing a bulk amount of gold, he may incur a discounted price that is lesser than what is being offered to the other buyers, so that will lead to a reduction of prices in the retail segment. Involvement of gold bullion associations: Like there is an association for every segment in our country, the jewelers have their own association which regulates the price structure of the gold for the particular day on a daily basis. These prices are fixed twice a day. It is generally based on the End of Day (EOD) price in the previous day and the international gold market standing at that particular time as and when calculated with other incurred cost on making the gold into a marketable item which in turn leads to the variation of prices in different cities. Government stand on import duty: Our government also plays a pivotal role in this segment and one may wonder what exactly the government’s role in the bullion trade is. Well, the government not only fixes tax rates but also the rates of import duty and as India essentially does not mine gold but imports it from other countries the rate of import duty also plays an important role in the fixing of price for the retail segment. The import duty is based on the deficit or the surplus of currency pooling, if there is a deficit then there will be a rise in the import duty and vice-versa. The value of rupee: The position of rupee against an international currency like the dollar on that particular period also plays a very important role in the pricing of the gold. If the value of rupee falls in the international markets then there will be a significant rise in the price of gold and when the value of rupee goes up the gold rate will decrease. But in the recent years, the price of gold has been fluctuating, either it is too high or there is a steady decrease in the price, so the status of the gold market is in balance. To sum it up, one can easily say that gold has lost its lustre and has become a non–performing asset in the recent years. Yet, the market for gold in India has not lost its Midas touch.